Whoa, folks. I’ve just returned from a special pre-screening of the new Cosmos reboot (to air this Sunday at 9/8 central on FOX…and 9 other networks), and was really blown away. I’m a huge fan of the original series and was worried it wouldn’t live up, but based on what I’ve seen tonight, it stands a good chance. First, the visuals are stunning. I imagine it’s a little like what watching the original Cosmos was like (which at the time had groundbreaking special effects). I was lucky enough to see it the big screen at a planetarium, which made it that much more impressive. The show’s host, Neil DeGrasse Tyson, also delivers. He’s got just the right type of presence – cool, knowledgeable, in love with science – a great guy to show you around the universe. As for the science, at least in the first episode it’s pretty well known stuff – they don’t spend a great deal of time on explanation, but maybe that will come in later episodes as the first was a general tour of what the series will be about. Then again, the pacing is perfect, so maybe less specific or detailed explanation is a bonus. The episode moved from one astounding thing to the next, and I never felt bored or like I was watching NOVA (which I love, by the way, but is a different tone than what Cosmos needs). The music is also terrific, but there’s no memorable riff like Vangelis provided – at least not that I recall. But several things are back from the original, including verbatim quotes (e.g. “we are all made of starstuff”), the ship of the imagination, and the cosmic calendar. The animations – which I was initially concerned about – are very well done, and the first episode flashbacks focus on the life of Giordano Bruno and his persecution by the Catholic Church (by the way, if anyone noticed what looked like Jesus rising up toward heaven in the trailer…it’s actually Bruno…which makes much more sense). My favorite part of the episode is near the end, when Neil gives a brief, personal tribute to Sagan. The two first met when Neil was an unknown 17 year old from the Bronx – Carl was kind enough to invite Neil to come up to Cornell to tour his lab, and spent an entire Saturday with him, inscribing a signed copy of one of his books, and even driving Neil to the bus stop and giving him his home number in case he had any trouble getting home. Neil gives a great line, something like “When I was touring Ithaca, I had some idea I wanted to be an astrophysicist, but I also came away knowing what type of man I wanted to be.” The tribute features some old footage of Carl, and it’s quite stirring – I actually got a little choked up. The two friends I came with – who had never seen the original – were also impressed. They seemed mesmerized by the size of the universe and the cosmic calendar – the exact reaction I’m hoping millions of people around the country will have. Here are a few photos from the event – it was happening live in a few other cities across the U.S., and Neil, Ann Druyan, and Seth MacFarlane also sat for a Q&A after the screening (which I wasn’t able to stay for but you can view here). 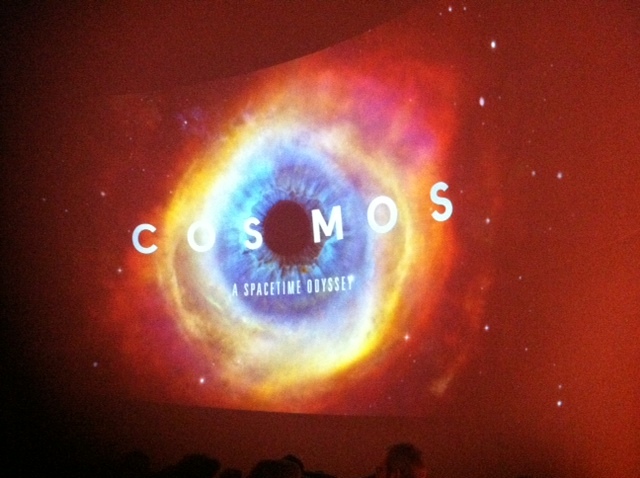 Cosmos about to play on the big screen at the UT-Arlington Planetarium. 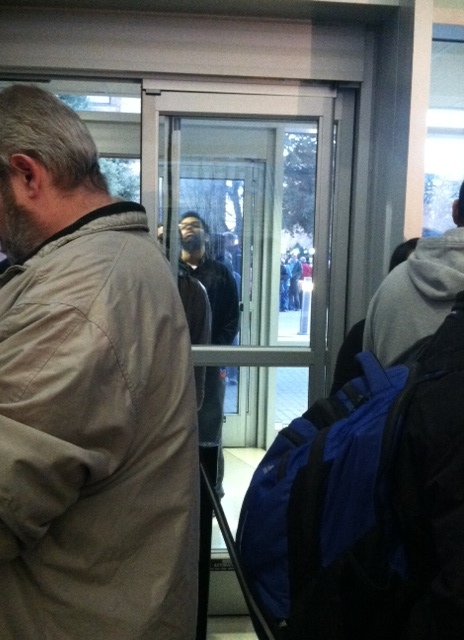 The line stretching out the door for the Cosmos Premiere at UT – Arlington.